Football Headquarters! Amazing food and drink specials for all the football games! We have the NFL ticket and more TVs than we can count! No matter who you root for, we’d love to have you here! Claddagh Pub opened in the Spring of 1995 which was a continuation of a family owned Irish Pub in downtown Baltimore on Chase Street in the 1970’s and into the 1980’s. As a family, we decided that this business was for us and we were ready to bring this concept to Canton. In the early 90’s, Canton was going through a rebirth and we knew it was going to be the place to be. Although we are not newcomers to Canton (born and raised on O’Donnell Street), it was becoming unrecognizable with all the new renovations and takeovers by a much younger generation. 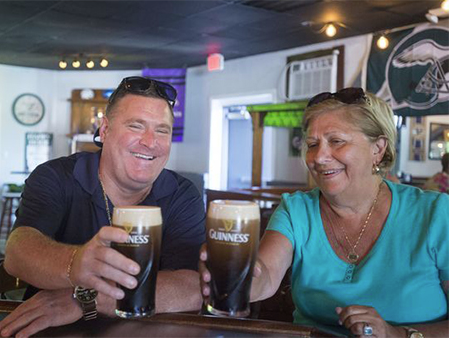 Twenty two years later, Claddagh Pub remains a staple on the Square and we love what we do and we hope to continue this adventure for many more years. Thank you to all the wonderful friends, old and new, and to all the different employees that have gone through our doors and helped us be the best that we can be.